Near southeast end of South Manitou Island, abreast south side of Manitou Harbor, 3/16 mile north of South Manitou Light; Lake Michigan. Turned over to the GSA in 1962. Gus B. Lofberg was appointed keeper on 12 FEB 1902 and transferred to Station Racine on 4 NOV 1903. Jacob Van Weilden was appointed keeper on 4 NOV 1903 and transferred to Station Holland on 30 JAN 1907. Eli E. Pugh was appointed keeper on 11 JAN 1907 and transferred to Station Charlevoix on 24 AUG 1910. Allen A. Kent was appointed keeper on 1 AUG 1910 and was still serving in 1915. 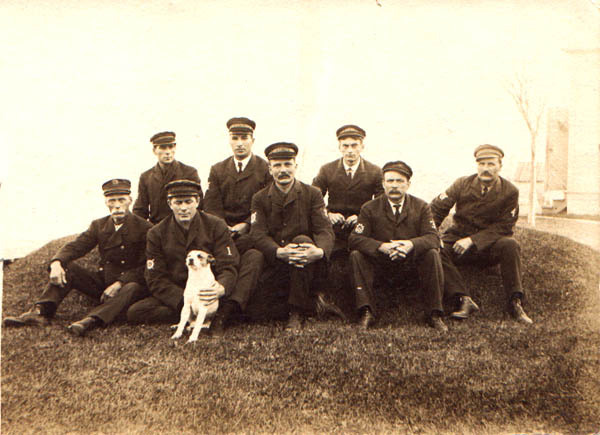 The South Manitou Life Saving Service crew posing for a photograph. The keeper is located on the far left noted with the insignia on his hat.